“….I understand that the entire “Church Singer’s Companion” is intended to consist of a five part series of fifteen or more separate volumes covering the entire range of Orthodox services. This work will require several years of devoted attention by you, your matushka, and several other volunteers…. You have my support and best wishes in this worthy missionary endeavor. May God give the increase to that which has been planted by you and those who work with you for His glory, for which cause I give my Archpastoral blessing for its continuance and advance. This collection of music contains settings of texts associated with Vespers, Matins, Divine Liturgy and other services of the Russian Orthodox Church. 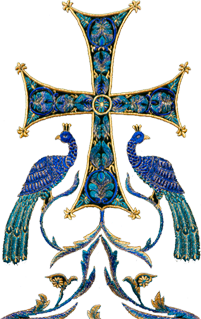 The translations are those associated with the Russian Orthodox Church Outside of Russia (ROCOR). The principle translators of the extra-scriptural texts are Rassophore-Monk Lawrence (Campbell) and Reader Isaac Lambertsen. 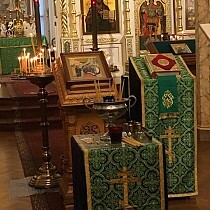 The Psalm texts come from the Psalter According to the Seventy from Holy Transfiguration Monastery, Boston, Massachusetts. The music, unless otherwise noted, is derived from the Russian Orthodox chant tradition. The dominant, but not exclusive, source of the music in this collection is a 1911 collection from Novgorod called the Sputnik Psalomschika, roughly translated, the Church Singer's Companion. It is this title that I have associated with a projected comprehensive series of Church Music, A Church Singer’s Companion, from which comes most of the music that is here placed online. Some of the music from A Church Singer’s Companion is available in book form, in particular, Vespers, Pascha, The Memorial Service, (Pannikhida), and several music conference service books. The material for the Matins volumes of A Church Singers’s Companion is being made available on this website before publication in book form. We hope to publish it in book form also, if God wills. All the music is set for four part mixed choir, SATB. Unless otherwise noted, the melody is always in the top, or Soprano, line of music. The form of the setting should not proscribe other possibilities, except to say that the Bass should always be sung by the lowest voice. Feel free to contact me to talk about this or any other topic related to this collection of music. Please pardon our appearance as we continue to upload music to this page. Check back soon for more updates.